Real Time - Europe and U.S.A. 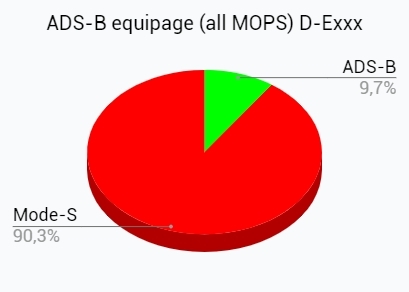 This graph shows the real time equipage of ADS-B MOPS Version 0, 1 and 2 of all aircraft monitored, i.e. mainline, regional, business, general aviation, state and military aircraft. Only those aircraft equipped with a MOPS Version 2 transponder will be compliant from 2020 within EU and U.S., subject to their individual adherence to all data requirements. Among those aircraft shown as non-compliant there may be aircraft that are not required to be equipped with a MOPS Version 2 transponder, as they do not fly in mandated U.S. airspaces or are slower/lighter than stipulated by the EU mandate. 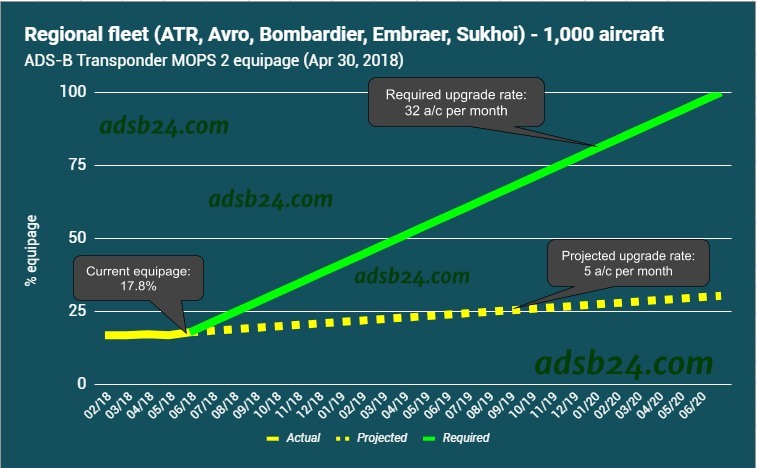 Tomorrow at this point: "ADS-B MOPS Version 2 Equipage - Mainline fleet"
This graph shows the real time airborne NIC and Radius of Containment (RC) of all ADS-B MOPS Version 2 aircraft monitored. Only those MOPS Version 2 aircraft transponders providing, among other parameters, a NIC (RC) of equal to or better than 5 (<1 NM) for EU resp. 7 (<0.2 NM) for U.S. airspace will be compliant from 2020, subject to their individual adherence to all other data requirements. Tomorrow at this point: "Navigational Integrity Category (NIC) - all ADS-B aircraft"
This graph shows the real time equipage of ADS-B MOPS Version 2 transponders of Airbus aircraft, in relation to all Airbus aircraft monitored (in %). 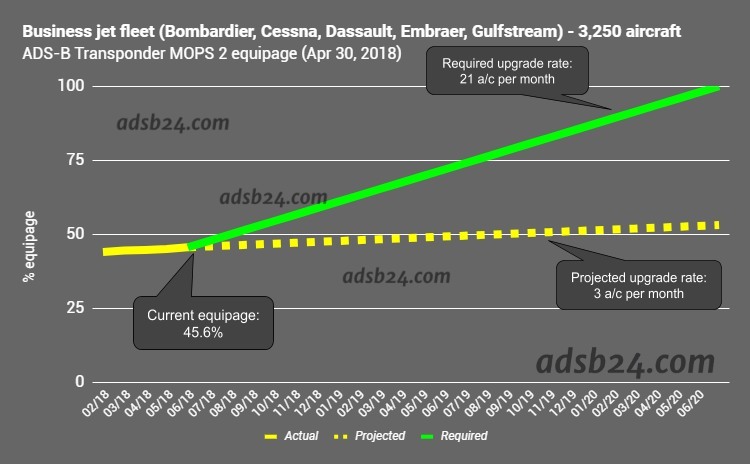 Tomorrow at this point: "ADS-B MOPS Version 2 Transponder Equipage - Regional"
This report will be followed up in April 2019. 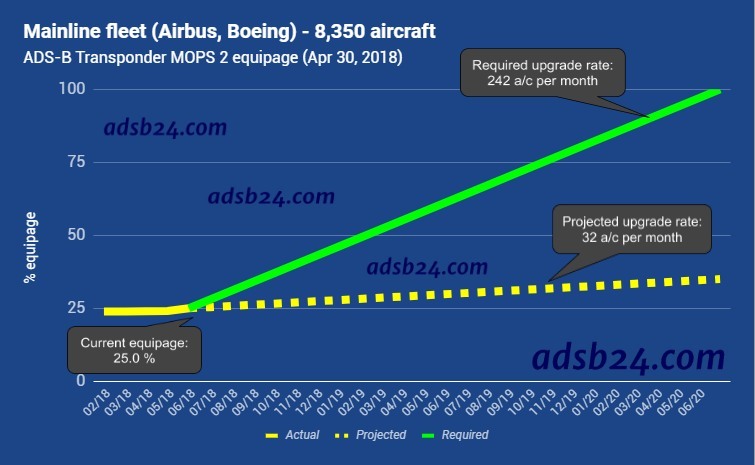 Until April 2018 the number of mainline jets (Airbus, Boeing) equipped with a compliant ADS-B MOPS 2 transponder has increased to 25.0%. Due to new compliance problems appearing in some fleets the true compliance rate is lower, though. With the current upgrade rate and taking into account new deliveries and retirements the mandate cannot be met unless more than 240 aircraft will be upgraded in each of the remaining 25 months. The actual upgrade rate is approx. 30 a/c per month. Until April 2018 the regional aircraft equipage has increased to 17.8%. 32 a/c must be converted per month to achieve the June 2020 mandate. However, we understand that for certain older airframes a STC is still not available to install the required MOPS 2 transponder. Business jet equipage has slightly improved to 45.6% up to April 2018. Only Dassault and Gulfstream fleet equipage exceeds 60%, while all other fleets stay well below 30%. For some fleets STCs for a MOPS 2 transponder upgrade are not available yet. ADS-B is often seen as a solution to enhance low airspace and VFR flight safety.The availability of certified low cost ADS-B transponders and GPS devices is rapidly increasing thanks to the big demand due to the 2020 U.S. ADS-B mandate. As the EU mandate does not cover light aircraft the current EU equipage rate remains very low and no incentives are yet seen to have aircraft owners upgrade their aeroplane. E.g. for the fleet of D-Exxx light airplanes (single engine, MTOW below 2,000 kgs) our status report shows an ADS-B equipage rate of nearly 10% only (all MOPS types) (April 2018). Only these transponders squitter position, altitude, speed and other essential data and can be seen by aircraft that are ADS-B-in equipped.